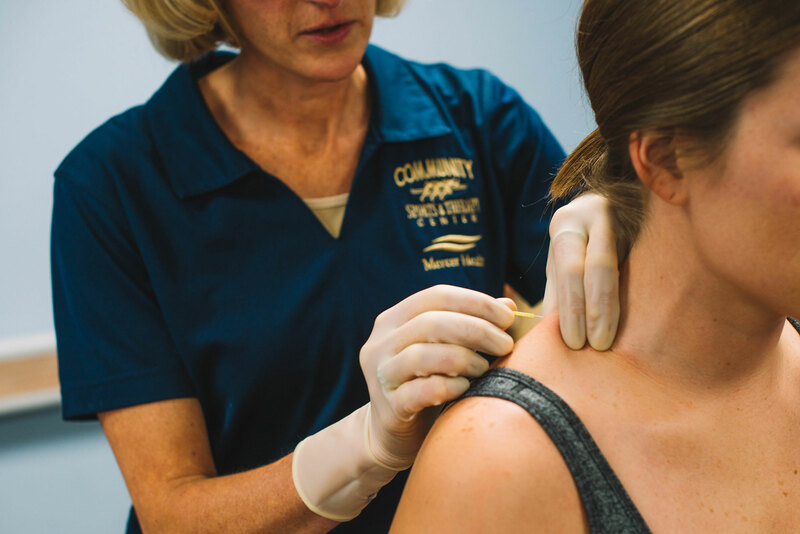 Dry Needling is a specialized therapy technique in which a very fine filament needle is inserted through the skin and into tissue. This causes a micro lesion which helps break up shortened tissues, inhibiting reflexes from the nervous system, normalizing the inflammatory response, and assisting in decreasing pain. The mechanical and neuromuscular effect provides an environment that helps the body to self heal, which ultimately decreases pain. Dry needling is NOT the same as acupuncture, but is based on modern scientific study by western medical practitioners of the musculoskeletal and neuromuscular systems. Dry needling is a very safe and relaxing process. In some cases, a needle being inserted into a trigger point muscle can create a slight ache, but there is no sharp or excessive pain, and indeed many patients do not feel the needles being inserted at all. The fine filament needle is very thin, and is pushed through the skin versus cutting the skin, which helps reduce discomfort. Your physical therapist will strive to make your experience comfortable and therapeutic. This varies from person to person. Patients can experience decrease in symptoms, improvement in function, achiness, or soreness. The soreness, if present, may last 1-2 days. After a dry needling session, it may be that patients feel a little tired, but there are no lingering effects and most people are able to continue with their day (including athletic performance) as normal. It is uncommon, but possible that treatment might increase your symptoms. Inform your physical therapist so adjustments can be made to your treatment.